When I was in New York City the end of June, I visited the S&S offices, and they took me into their studio and had me answer some questions. Here are the results from that time in the studio! I had to be careful - didn't want to squish my friends! In case you missed it, every Tuesday and Thursday leading up to the release of Sprinkles and Secrets, I'm posting a video. Yes, a silly video with cupcakes. What do we do when it gets hot? Today is August 20th, which means, just one more month until this book comes out!!! I didn't have a second book planned. But when so many readers e-mailed me, asking if there would be another book, I decided to write one. 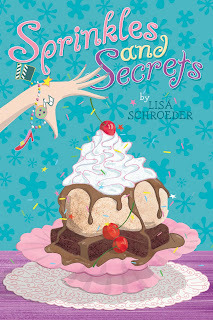 This book is my gift to all of the fans of It's Raining Cupcakes, and I can't wait for you to read it! If you are planning on getting it when it comes out, it would actually help me out a lot if you went to your local book store and pre-ordered it in the next couple of weeks. This means you buy it now, and when it comes in, they let you know it's in, and you have your very own copy, guaranteed. If a book gets a lot of pre-orders (at a bookstore), that's a good thing for an author, and they are likely to order more copies than they usually do. I've heard many people are saddened by the closing of Borders. The truth is, if we want book stores to stay in business, we must support them. Anyway, I know some kids have been waiting a long time for September 20th to get here. I'm so happy it's almost here!! In a few weeks, I'll be announcing a special SURPRISE for everyone who gets the book and reads it in the first few weeks. There will be a special question you answer, via e-mail, and when you do, I send you something really fun!! 2. Tomorrow you will want to tune in here to see...um, me making a fool of myself? I have a series of videos planned every Tuesday and Thursday up to the release of Sprinkles and Secrets. The series is called "Fun with Cupcakes." The twist? I am one of the cupcakes. Oh boy. The things we do to help make people aware of our books. Did you watch the finale last night? So many great performances that were chosen to be done again from the season. I think this one is my favorite though. I just love it. I have watched it more times than I will admit. What a final four! Wow. I won't say anything about the winner in case you haven't watched yet. I'm just sad it's over! I've started a new project, and every time, it amazes me how it always feels scary. Overwhelming. Impossible even. I don't even know how many books I've written, published and unpublished, and still, here I am, doubting myself up, down and sideways. I did get myself the screenwriting book SAVE THE CAT by Blake Snyder I've heard SO many authors talk about, and I have to say, I love it. He breaks down the making of a story in such an easy-to-understand way. Yes, it's geared toward writing screenplays, but it easily transfers to writing novels as well. Want to know what makes a good catalyst moment? Want to know what strategies to use when it's time to give your readers a breather, and where that should happen? I could go on and on, but I won't. It's good. Period. As I'm writing this draft, I'm reading the book every night, based on where I'm at with the draft, and keeping in mind what my purpose is for the very section I'm writing. It's been incredibly helpful. Anyway, back to why I'm doing this blog post. :) I was thinking about the things that help me when I'm drafting a story, that I want to remember, and thought I'd share them. So here is my "Things to Remember When Writing a First Draft List," in no particular order. 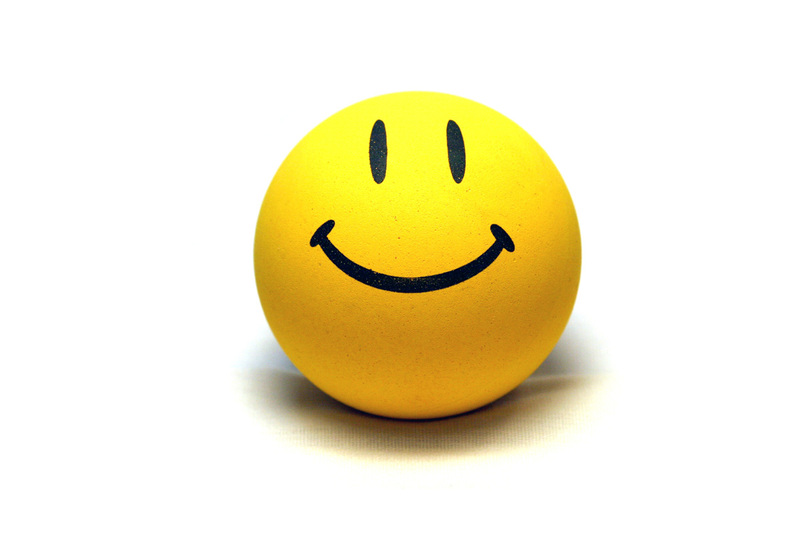 1) Sometimes it is fun and sometimes it is not. I think we want it to be fun all the time, but it just won't be. There will always be hard parts. Fight your way through them, and don't let them win. 2) Free writing in a different document is okay, to sort out thoughts, to ask yourself questions, whatever. Any writing is helpful writing, even if it doesn't necessarily add to the word count. 3) Some days, the hardest part is opening the document. So make it as easy as possible, by leaving off in an exciting spot and leaving yourself notes as to what you envision happening next. It's so much easier to reenter with little notes than simply a blank page. 4) Doubt is your biggest enemy. It will sneak up on you when you least expect it. It till make you cranky as you battle it, day after day after day. I try very hard to think of the story as something I'm writing just for me. It may be good, it may be bad, it doesn't matter, I'm the only one who will read it and I have to keep writing because I want to see how it turns out. I really think it's when we imagine other people reading it, thinking about whether there's a place in the market for it or not, those kinds of things, that's when we find ourselves getting anxious. The first draft is not the time to worry about any of that, and as much as we can, we need to rid ourselves of those thoughts somehow. Some days, if the doubt is really, really bad, I allow myself a break. And that means a break from all things publishing-related. I go see a movie or I go somewhere with my family. At that point, I need to get "out of my head" and gain some perspective. It's just a book!! 5) Be kind to yourself. If a little chocolate or some delicious caffeinated drink makes opening the document easier, why not? Once you get going, get in the zone, a lot of times, the need to munch or sip or whatever falls away. 6) Every little bit helps. Leave the document open and when there's time, sit down and work for 15 minutes. A big chunk of time may be hard some days, and don't let that keep you from getting in some words. 7) It doesn't have to be perfect. Let's repeat that, shall we? 8) It doesn't have to be perfect!!! I'm curious, what's on your "Things to Remember when Writing a First Draft" list?? Some authors make a lot of money. Some authors make an okay amount of money. Some authors make very little money. And sometimes I feel like there is a bit of pressure for the authors in the last two categories to act as if they are in the top category and spend all kinds of money they really don't have on promotional things. And I do not understand this. It's kind of like the - how much time should I spend on social networking thing, except it's - how much money should I throw at all of these authorly things. After doing this for a while, I think the answer is the same. You don't *have* to spend anything and it's perfectly okay, just like you don't *have* to spend time doing the social networking thing unless you want to. In the end, how many books you sell is not dependent on how much you spent on your web site, how many fancy bookmarks you bought, how pretty your author photo is, how incredible your book trailer is, etc. How many books you sell is going to be dependent on what kind of push you get from your publisher, whether the book stores pick it up or not, whether it's the kind of book that gets people talking, and honestly, quite a bit of luck. I commented on a thread on a message board recently where someone asked about web sites. I replied that I am currently using blogger for my site, because A) it's free and B) I can update it whenever I want to. So many people pointed the person asking the question to all of these awesome designers, and all of them cost money. Some of them a LOT OF MONEY. We need to remember, not everyone has a lot of money to spend, and I wanted to speak up and show the person that I am one author who is keeping that $1000-$3000 I could spend on a web site to pay for my kid's braces, and I'm not going to go into debt just so I can have a site that makes people oooh and ahhh. Do some people come to my site and go, eww, she's using blogger? Probably so. Do I believe that most kids/teens/parents/librarians/teachers coming to my site, who are the ones reading my books, really care? No, I don't. When I built my site by myself, using blogger's tools, I kept in mind the things that are important to me when I'm going to someone else's site. I wanted the site to be clean, easy to navigate, and have the information at their fingertips that they were looking for. Do you know how many professional sites I've been to where I thought it was too busy or hard to find things or any number of things? A LOT! Professional doesn't always mean good. I know some people have strong feelings about authors and what their web site looks like. Just like some people have strong feelings about book trailers. And some people have strong feelings about bookmarks. And some people have strong feelings about author photos. In the perfect world, every author would have all kinds of money to spend on these things. But we don't live in a perfect world, and here is what I want really want to say on the subject, maybe for myself more than anyone. If you don't have the money to spend on these things, (and I'm going to go out on a limb and say 85% of authors don't), then keep your hard earned money for yourself and please DO NOT FEEL BAD about that. Do the best with what you have. When you get your advance, come up with a budget for promotional things that is realistic for you and your family, and then stick to it by figuring out what is most important to you! I got my author photos when a studio was having a sale. I waited patiently until it was something I could afford. Some authors have their spouse or friend take lots and lots and lots of photos with a digital camera until they have one that's good enough to use. Will the professional ones look better? Maybe. But isn't it true that we can always do better, that money can always BUY better? It's the same with book trailers. Some people will say - don't do a book trailer unless you can do a REALLY incredible one with actors and a script and on and on. Well, I don't have that kind of money, so does that mean I shouldn't do one at all? I don't think so. I made mine myself, for free, and yeah, there are lots of trailers that are better, but does it matter? I did what I could and I shouldn't have to apologize for that. 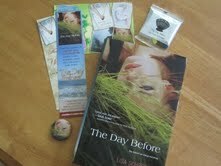 Because really, am I out to A) outdo most authors, or am I out to B) do what I can for my book without breaking the bank? For me, the answer will always be B. It can be really easy to get caught up in what everyone else is doing, and I just felt the need to post this today and say, if you are an author who is feeling pressured to spend, spend, spend to keep up with the Joneses who are around the corner on the internet, put the credit card down and get back to work writing the best book you can. Like we've heard a million times already, but seem to need to be reminded from time to time, it's the writing that matters more than anything else. 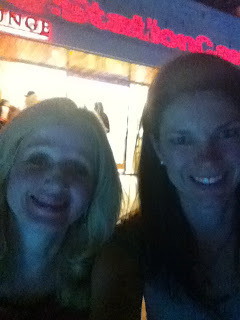 I flew to Vegas on Friday to see the lovely and talented Lindsey Leavitt. Have you read her Princess for Hire books or her awesome YA novel, Sean Griswold's Head? If not, you should! I love Lindsey so much. We have known each other a long time, before she had any kids. Now she has three! And they are SO cute. I woke up this morning and was sad I didn't have a baby hug to look forward to not to mention a fun friend to talk to. Anyway, we only got one picture of us - how did that happen? Oh, because we were too busy having fun! 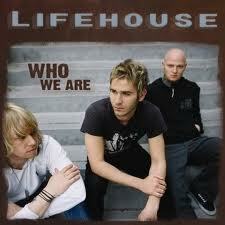 Friday night we went to a Lifehouse concert. It was at the Red Rock hotel and casino and what a great venue for a concert. It was outside, where there are lots of swimming pools, so we sat poolside for a while, with our feet in the water, and then walked around, finding different spots to watch the show. My favorite part, by far, was when the band took a break (it was SO hot that night) and the lead singer, Jason Wade, grabbed his acoustic guitar and took requests from the audience, and just sang with his guitar. SO awesome. I didn't take a picture of that, but here's a pretty good picture of him. 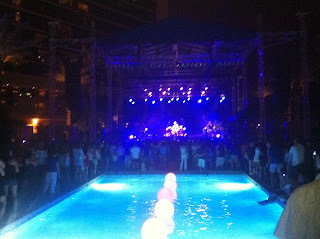 And one more of the view we had toward the end of the show when we stood at the end of one pool and looked straight on at the band as they sang one of my favorite songs, "Everything." We visited a darling bakery called Retro Bakery. 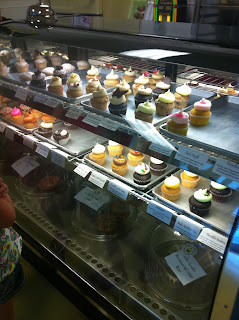 Lindsey bought us a dozen cupcakes, and I am not kidding when I say they were some of the best cupcakes I have EVER had. Seriously, if you are in Las Vegas, check them out. 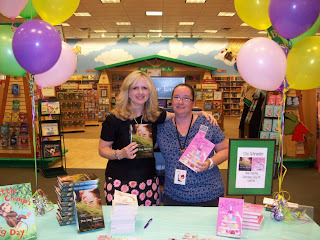 Saturday I signed books at the Barnes and Noble on N. Rainbow and met the fabulous bookseller, Crystal, who is known far and wide as one of the best advocates of YA fiction out there. Thanks to those of you who came out and bought books, it was GREAT to meet you. Here's a picture of me and Crystal. 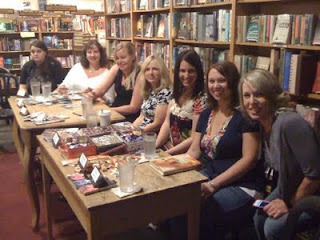 On Sunday, I flew to Seattle to meet up with five other YA authors for a Summer YA Extravaganza at Third Place Books. Here we all are (from right to left): Kimberly Derting, Suzanne Young, Cat Patrick, Me, Mandy Hubbard, and Eileen Cook. (Picture courtesy of the marvelous Heather Davis). I had a piece of candy in my mouth when she decided to shoot this picture, thus the reason I am not smiling. I can't help it, I LOVE CANDY and Cat brought a LOT of candy!! 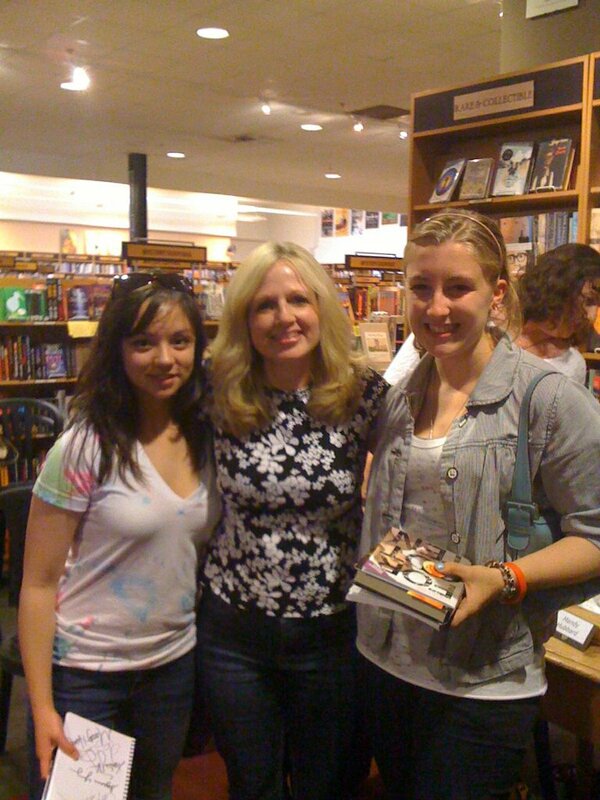 One of the highlights for me was meeting Maddie, a teen who wrote to me shortly after I Heart You, You Haunt Me came out, and we've stayed in touch ever since. This is me with Maddie (on the right) and her friend Lauren. I drove home with Suzanne last night, and from now on I will only drive to/from Seattle with Suzanne and her husband because it was REALLY fun and the 3 hours flew by! Now, there are chores to do and bills to pay and kids to catch up with and SUNSHINE to enjoy! It's supposed to be 80 and sunny ALL WEEK LONG!!! While much of the country has been burning up, it has been a cool summer here, so it feels like summer has finally arrived here! I can't believe it's already August 1st already. YIKES!